When you’re starting out, one of your biggest challenges as a musician is getting heard. It doesn’t even matter how good (or bad) you are; bloggers, influencers and tastemakers are just too inundated with requests to give you a listen. You can’t just throw in your song as an attachment and start shooting emails. Don't Feel Like Reading? Watch The Video! A common practice among tech entrepreneurs is to describe their products in a one sentence “elevator pitch” (though technically elevator pitches are about 30-seconds long). There is no talk of “two-sided driver-passenger marketplace” or “taxi-aggregation” or any other fancy jargon. It’s a simple description of what the product does. This tells potential investors and users the gist of the product without having to deal with unnecessary buzzwords. Once you dig deeper, you’ll realize that pitching your music isn’t any different. Just like a startup founder, you’re also trying to pitch a “product” (your music) to an end-user (a listener or a blogger). Distilling the essence of your music into a single sentence will tell these “end-users” exactly what your music is about, what it sounds like, and whether it will appeal to them or not. 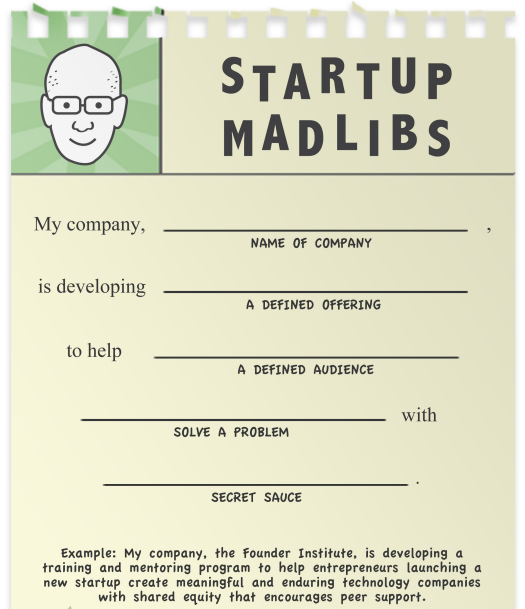 Among startup founders, a common way to create a one-sentence pitch is through a “Mad Libs” approach. 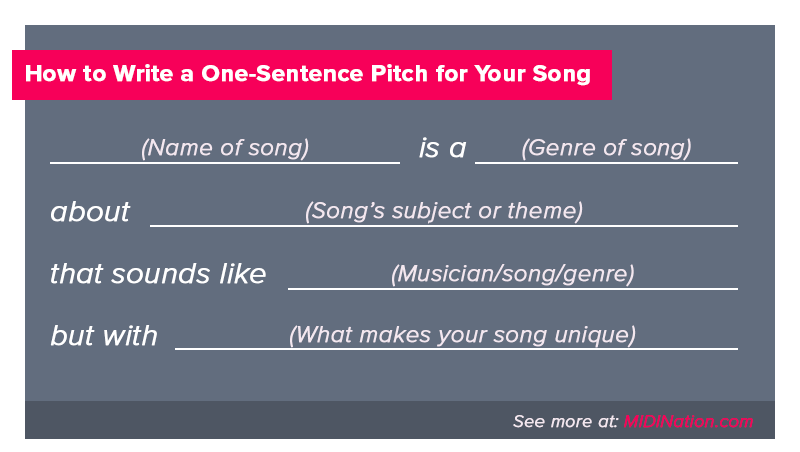 With some modifications, you can use a similar mad libs approach for crafting your one-sentence song pitch. [Name of Song], is a [Genre] song about [Song’s Subject or Theme] that sounds like [Musician/Song/Genre] but with [What Makes Your Unique]. Here’s the template in an image format for easier sharing/saving. 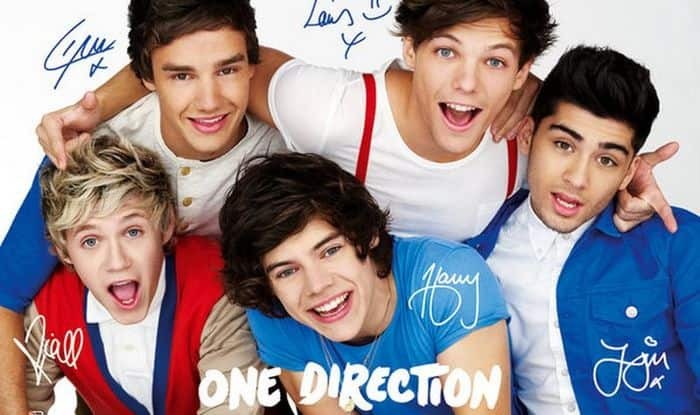 It gives the reader the basic information about the song: its name and genre. It tells the reader about the song’s subject, theme or backstory in a few short words. It gives the reader an anchor to compare the song to. It shares insight on your song’s unique feature. Hotline Bling is a contemporary R&B song about a jealous man worrying about his girlfriend that sounds like a R&B and hip-hop fusion but with influences from trap and retro R&B. Try doing this for a few of your favorite tracks. It sounds easy, but it isn’t. Do this for all your tracks and you’ll find it much easier to create a compelling pitch. Take this from a blogger: there’s nothing we hate more than wasting our time on a song that doesn’t fit our audience. Sure, your death metal track might be great, and I might even recommend it to friends, but if I’m running a blog about EDM, I can’t possibly share it with readers. So basic rule when pitching: make sure that your track fits the blog’s audience. Most blogs will make it very clear what kind of tracks they like to share on their ‘About’ section. Spend a couple of minutes reading this page to figure out their target genre. In case the blog hasn’t made it clear what genres it covers (i.e. it is a multi-genre blog), assume that the blog will cover most alternative and mainstream genres outside of extreme genres (like death metal). If that doesn’t work (or if the about page isn’t clear), just spend some time listening to the blog’s recently shared tracks. This will give you the best-possible indicator of what music it likes to share. When you first email a blogger, you’re a completely unknown quantity to them. You’re not a real person making incredible music; you’re just another email address in their inbox. One of your biggest challenges, therefore, is to stand out. And the easiest way to do that is to build a relationship with the blogger in question. Think of it this way: if you were a busy person with 200 new emails in your inbox every day, who would you rather respond to first - ‘Random Musician #36’ or “Joe Musician who keeps sharing incredible insight on social media”? The trouble is: building relationships with bloggers is hard. There are just too many musicians jousting for their attention. Back in my marketing days, we had the same problem when we were trying to get shares from leading influencers. To get their attention, we developed what I call a “5-4-3-2-1” framework. This framework works for most small to medium-sized blogs. Retweet 5 tweets by the concerned blogger on Twitter. Add 3 long and insightful comments on the blogger’s recent blog posts. 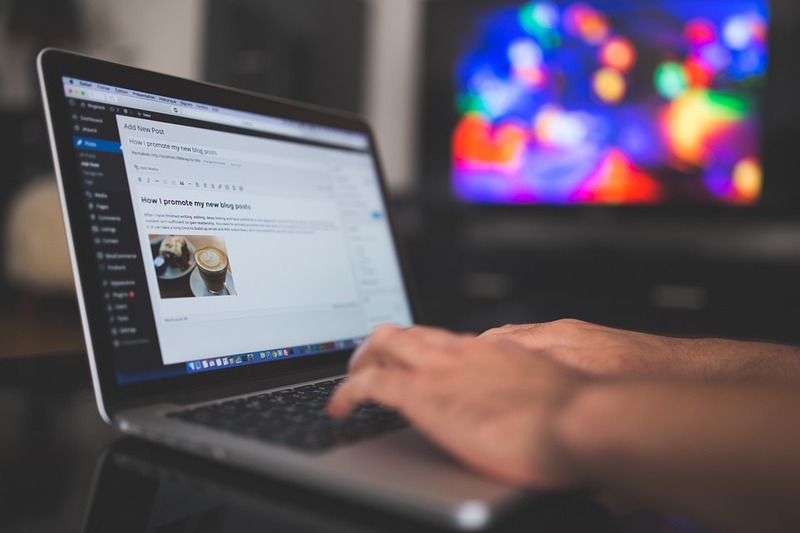 Send 2 helpful emails to the blogger with the goal of getting at least 1 response. I know this sounds like a lot of hard work, but by the time you send your last email to the blogger, your name would be pretty familiar to them. After all, you’ve interacted with them more than a dozen times already. Answer a question they recently asked on social media. Share content they might find interesting. Make sure this isn’t anything obvious or mainstream. Introduce them to a connection who might help them (such as another blogger). Create some unique content based on one of their posts, then share it with them (such as a free cover image for their best-performing blog post). The point is: you’re trying to get noticed in the inbox. And you’re trying to do that by giving them value in some form. This is the foundation of a relationship: give them value to get value in return. 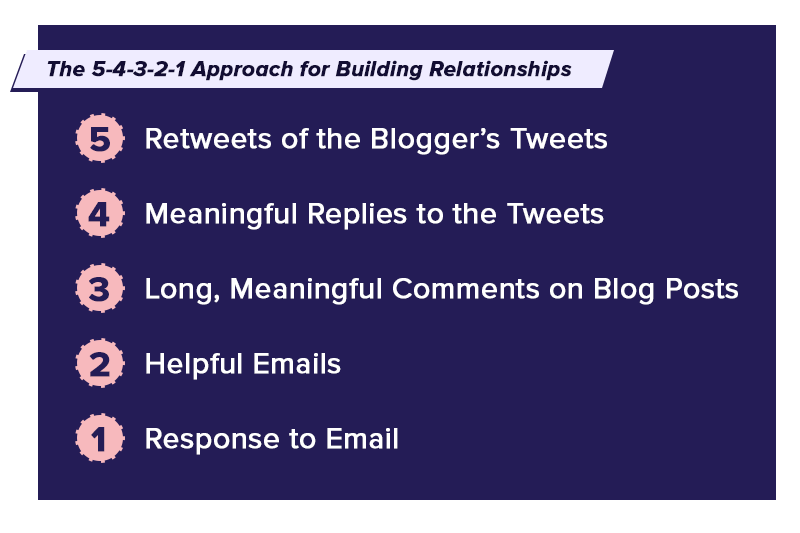 Since all of this is a lot of work, I suggest building relationships only with the highest-value blogs on your list. For the rest, you can, at most, leave a few comments on their blogs/social media and shoot off a pitch. This is a tough one - on the one hand, you don’t want to come across as too polished (you are an aspiring and struggling musician, after all). At the same time, you don’t want to be some amateur with half-baked ideas - bloggers want to listen to good music. Of these, the most important for me is your image. Think of how different musicians present themselves in their pictures. Like how all punk bands look like, well, punks. Which is to say: your band’s image should evoke the genre you’re playing and the kind of music outlets you want to get published in. You don’t have to follow all the genre conventions, of course (otherwise we’d have never had a pink polo wearing Kanye rapping). But there should be at least a bit of alignment between your target genre and band image. It’s also a good idea to have a website on your own domain. Website builders are effectively free and domains cost just $10/year, so you have no excuses not to. (I’ll have an article on building your own band website at a later date). It pains me to see submission pitches that drone on and on about the music. Even worse is when musicians beg and plead for spots. Or apologize for the quality of the demo. No one has time to read through 500-word pitches filled with apologies and run-on sentences. The best approach is to keep it short and simple. Focus on the best parts of your music and give the reader the highlights only. I wanted to submit a song for your [blog section]. I’d love to hear your thoughts. You can find more about me on my website link below. This template keeps things simple. It is personalized; it references the blogger’s first name and includes a line about the blog (customize this as you see fit). The story behind the song or your music in general - in a single sentence. A comparison to an existing artist or song. This can help bloggers decide if they’ll like your music. (Although this isn’t necessary since you’ve already included a comparison in the one-sentence pitch). Links to your website in the signature. A ‘P.S.’ section with a link to the artwork. This is actually one of the most-read parts of any email. I’ll do a more detailed breakdown of a successful pitch in a future article. I’ll also include guidelines on finding email addresses, using a compelling opening hook and closing warmly. Besides these, follow the obvious tips: observe the submission guidelines, personalize your emails, and be polite. Follow-up once (and only once). And most importantly: keep on making great music, and keep on trying.